Okay, here are the pictures, for a side-by-side comparison. The only change between them is the miracle dip, which I linked to earlier. The dip looks really good on metal, such as armor. But it also brings out details that painters of my skill level cannot paint individually. Wow! You've really sold me on dipping! One thing I was going to mention but forgot before is application. 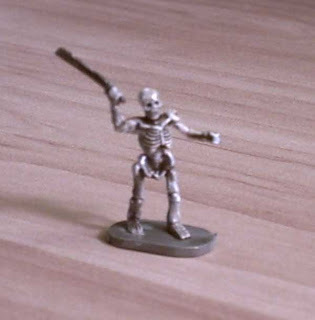 Some guys actually dip the figures, but I usually have mine stuck to strips of cardboard (so I can paint a bunch at a time). So when it comes to dipping, I use a brush. Clean up involves something noxious called mineral spirits. But I found a work-around: At my local dollar store I found a set of 15 wood-handled paintbrushes. At that price, they're disposable; once I'm done dipping, in the trash they go. very well done. 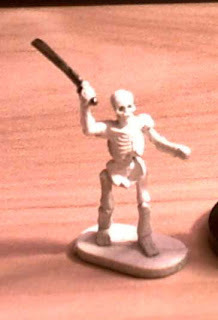 If I paint miniatures ever again, I'll dip.